Did you ever play with a kaleidoscope as a kid? But maybe you remember looking through the cardboard or tin tube and pointing the bottom at a lightbulb. As you twisted the tube, tiny colored bits split and fractured into all kinds of different patterns. Despite being considered a child’s toy, kaleidoscopes are alive and well. Modern makers create incredible works of art, making the ones you played with as a kid pale in comparison. To gaze through a modern kaleidoscope is to experience a moment to breathe and relax. But why and how can a kaleidoscope have such an effect on us? It’s all about the symmetry. At their core, kaleidoscopes are a perfect example of symmetry created by reflection. The multi-faceted reflections within a kaleidoscope give us the visual sense of balance and harmony. Each reflection is a perfect companion to the one beside it. And depending on the number of mirrors, there can be a plethora of patterns and combinations. As human beings, patterns provide instinctual joy and calm. It’s why we take pictures of penny tile floors and why we love the shape of a perfect maple leaf. Wherever we find these reflections and patterns, we will likely find symmetry. It doesn’t matter if it’s in mathematics, in science and nature, the arts and even our interactions with other people. We crave symmetry and harmony. The ultimate expression of symmetry is in the reflected similarity of the larger group. There’s symmetry in a maple leaf because it replicates itself along the vertical line. There’s symmetry in a pattern of hexagons across a floor because they’re each the same. The second you throw in a different element–an oak leaf or a square tile, for example–the symmetry is lost. If symmetry is comfort, then asymmetry is uncertainty. As creatives, much of our lives is spent taking people out of comfort and putting them into places of uncertainty. It’s how we encourage interactions between the creator and the audience. An artist creates a piece that opens dialogue between different people. A need to find information quickly requires a new UX design. And we all of have experienced an ad for a product we didn’t know we needed. 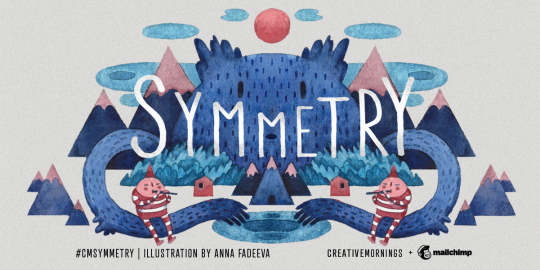 Each of these things takes something uncertain and offers a path back to symmetry. Surrealism. Surreal. Why is it so hard to define these things and yet almost everyone can say they’ve had a surreal experience? Perhaps surreal is hard to define because the word itself is inadequate. “Surreal” is an attempt to define a feeling, a brief second. We know it when it happens. We can’t describe the feeling before the moment happens and we still can’t, even after experiencing it. Surreal exists between the expected, the unexpected and the incomprehensible. It takes something we know, something we think we know, and then demands we expand our thinking. Or maybe it’s an attempt regain something we lost as we became adults. Lobster Telephone starts to make a bit of sense when you remember that you played with a banana phone as a child. Maybe that’s why we need surreal in our lives. It brings us back to the spontaneity and free association of childhood. In that world, a banana became a telephone, a blanket became the sail of a boat, and a tub full of bubbles created a mountain range. To watch a small child at play is to watch the imagination discover possibilities. Anything and everything can become part of a play world. Objects can be one thing one minute, and another the next. It’s ever changing, ever new and ever exciting. And from an adult’s perspective, it’s weird, bizzare and perhaps, surreal. As adults, we rarely see beyond the black and white world of objects in front of us. Becoming “more creative” often demands we get out of our own assumptions and into the magical world where anything can become anything. In that way, surreal is an invitation from our inner five year-old to come out and play. I don’t know about you, but the first thing that comes to mind when I hear the word “tradition,” is the Broadway musical, Fiddler on the Roof. It’s almost instinctual for me to start bellowing out Tevye’s classic song about tradition. Yes, I occasionally have to stop myself mid-note when the word comes up in casual conversation. 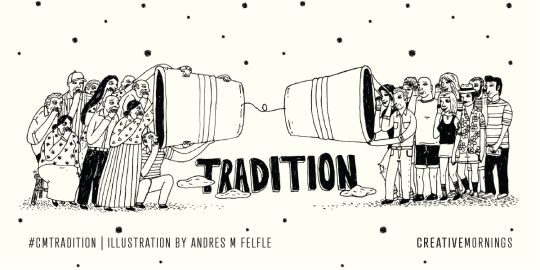 The second thing that comes to mind when I hear the word “tradition,” is holiday festivities, especially around Christmas. Even if you don’t celebrate the Christmas holiday, it seems everyone has a sacred tradition (the word of the day!) this time of year. One of my traditions this time of year is getting our family Christmas Tree through the Christmas Tree Program from the National Forests. Every year on the weekend after Thanksgiving, we load up the car with winter gear, cutting tools and Thermoses filled with hot green chili and start the journey over the Front Range and down into South Park. After picking up our permit at the Ranger Station, we head out to the Pike National Forest. We make a whole day of it, stomping around in the woods and cursing sharp pine needles. Inevitably, it’s the first tree we find that we take, but we still explore the forest for hours anyway. Once we have the perfect little pine, we lug it down to the car and try to remember how we tied last year’s tree on the car. I swear, the configuration of ropes and tie downs is different every year. Traditions are an important part of life, but they’re not just reserved for Broadway musicals or holidays. We might have traditions about what we wear to sports games so our teams will win. Or how we cook a family recipe for tomato sauce. We even have traditions for how we approach our work. Traditions provide structure, guidance and a way to remember what has gone on before us. They’re a way to find harmony in community and a source of peace for an individual. Tradition unites all of humanity. Not one person, culture or country is without traditions. Our traditions may be different, but each one celebrates those around us and the things we all find most important: our family, our friends and our community. 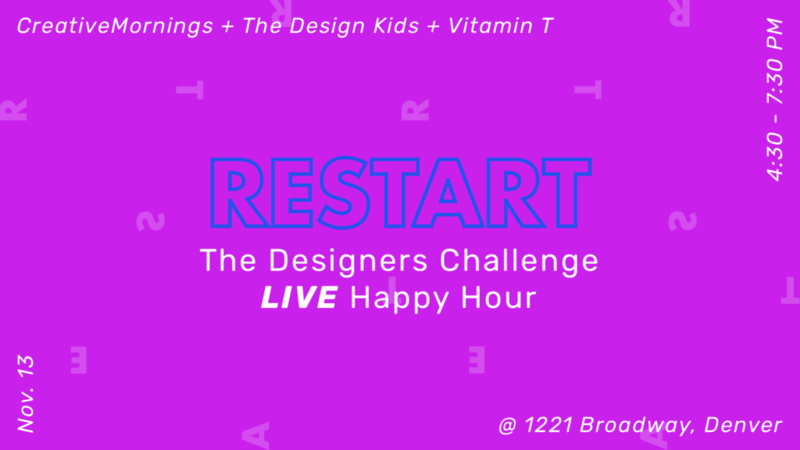 Join us for The Designers Challenge LIVE for our next happy hour on November 13th from 4:30pm – 7:30pm at Four Winds Interactive, 1221 Broadway, Denver. We partnered with The Design Kids Denver and Vitamin T to invite some very talented local designers/creatives to show off their skills to our community by designing LIVE on the spot. Come learn from the greats and hear them talk about their process while watching how they execute. This will be an amazing opportunity to gain new perspectives and learn fresh ways to approach design. 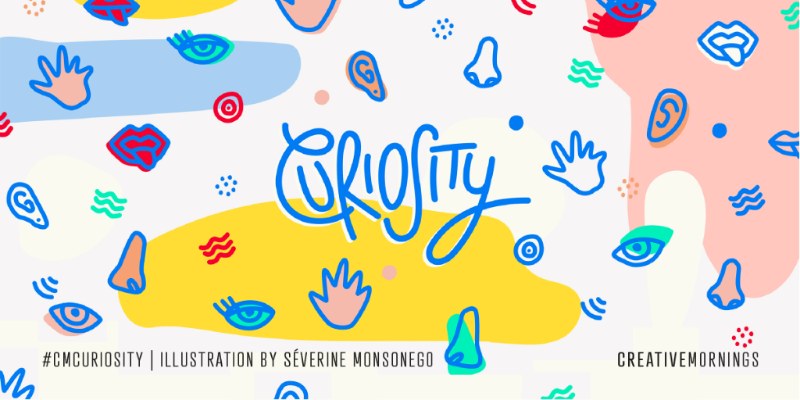 Registration will open up on the CreativeMornings/Denver website Tuesday, November 6th at 9am. Each contestant will have 24 hours before the event to prep, plan, sketch, take photos, anything they need to prepare to bring the designs to screen! And on the day of the event, they will have 45 minutes to design, LIVE! 5:50 - 6:35 // Designers have 45 minutes to bring their designs to life, LIVE on the screen, while Daniela Silva Riera, our MC, interviews each contestant and learns about their process. CreativeMornings is the largest face-to-face community in the world. With 190 cities in over 60 countries, and 307,000+ people who have attended morning events. 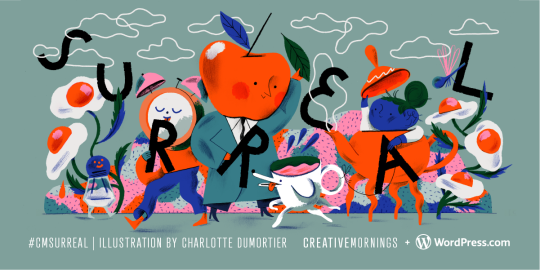 CreativeMornings is traditionally a breakfast lecture series, where each month a live event is hosted where people in cities all around the globe can come out, meet one another, and listen to an inspirational talk. The Design Kids is a global online resource and works with 100+ design universities and colleges, 500 design studios, and many more design businesses. Their community of 70,000 students and grads continues to grow and help individual emerging designers succeed. Vitamin T is a talent agency for digital creatives and the design-minded companies who love them. Their local team in Denver is one of the Denver chapter’s morning event sponsors. 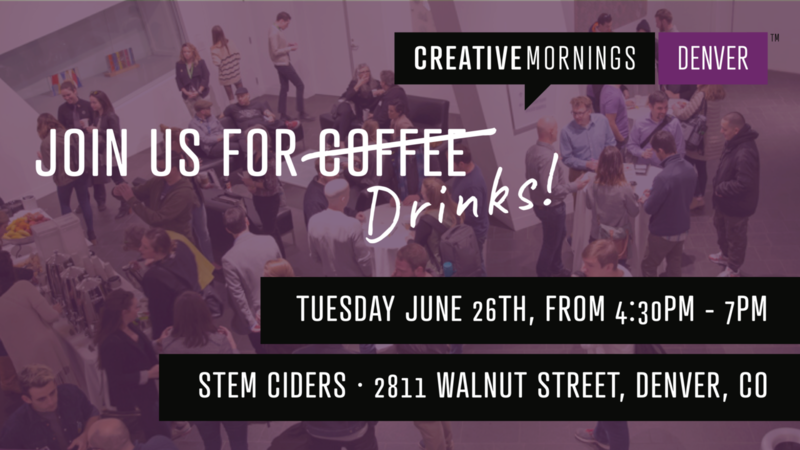 To celebrate 5 years of CreativeMornings in Denver, we would like to turn the mic to our audience. 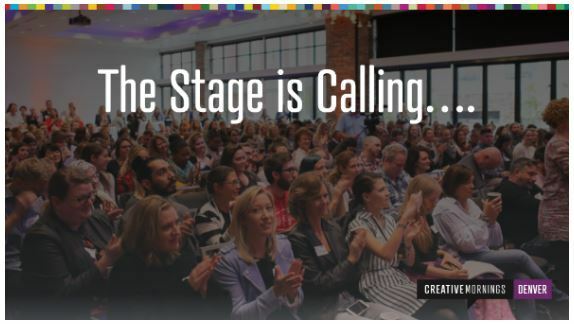 We’re inviting anyone interested to apply to be a speaker at our 2nd Audience Takes the Stage event in November. The application deadline is MONDAY, October 22nd at 11:59:59pm MST, and we will announce the chosen speakers on October 26th. November’s theme is RESTART. Does your story have a big restart in it? 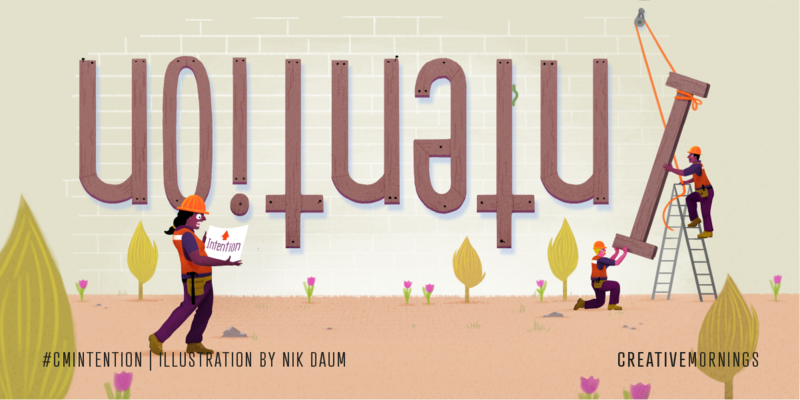 Does the act of restarting play a big role in your creative process? Do you have another unique thought, perspective, or background related to the theme? Head on over to our application page and submit your idea of what you’d like to present!! We want to know about it, and we look forward to hearing what you have to say! Show your love for Denver, with our fun CreativeMornings/Denver photo booth! Also, be sure to come by early, we’ll be giving out some special CRAFT stickers! And we have a fun craft for you!! Registration opens at 9am on Tuesday, June 19th on our website! We can’t wait to see your smiling faces! We’re starting a monthly happy hour series in addition to our breakfast events and we want you to join us! Why? Because we’re so passionate about getting to know our great community in Denver—and we want to share that with you.We’re going to be hosting a monthly happy hour at a local bar or restaurant to give you the opportunity to get to know each other better and talk about this month’s topic and lecture (even if you weren’t able to make it)— all while hanging out at cool spots around the city.On Tuesday, March 20th, our good friends at Ophelia’s Electric Soapbox (1215 20th St., Denver CO 80202) are hosting us from 5pm - 8pm. 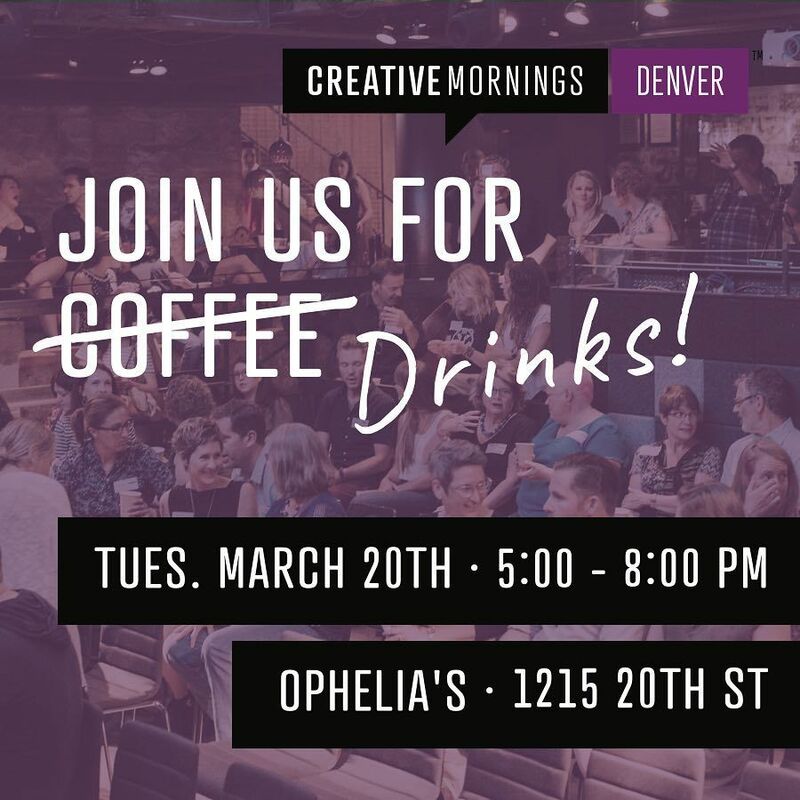 Ophelia’s will extend their special happy hour food and drink pricing, and also will be creating a special drink and appetizer around this month’s global theme of COURAGE… just for all you CreativeMornings/Denver fans! Registration opens March 13th at 9am on our website. Space is limited, so don’t forget to set your alarm clock and reserve your spot! When we hear ​the word “courage​“,​ we may think of superheroes, warriors, humanitarians, great leaders, soldiers, police, firefighters—​people who are quick to act when life is truly on the line, or where the stakes ​between​ wrong and right are ​highest. But courage​ is more than that. Courage is something we all harness daily simply because we are human beings. We are each faced with our own medley of​ ​challenges, goals, uncertainties, hopes and dreams, resources, real and perceived limitations, skills, and priorities. Courage ​can help us fuel our ​drive to accomplish the improbable and the significant, even when we don’t have it all figured out. We take leaps of courage daily to expand our potential, and we take calculated risks ​to help us build our futures or serve our communities. We ​also ​leverage courage when we invest in ourselves or other people. Courage helps us ​dance with uncertainty, rather than letting the unknown distract us from the dreams of our intuition. Courage ​lets us be audacious with our pursuits and our creativity, even when we are smothered in doubt or hesitation. Courage allows those with even the tiniest voice to be heard, and we call on courage when we speak the truth in the face of wild adversity. Courage calls on our values and our heart​s​, and is at the foundation of freedom, creativity, and the human soul. Perhaps courage is the ultimate tool of those who seek to change and create the world? 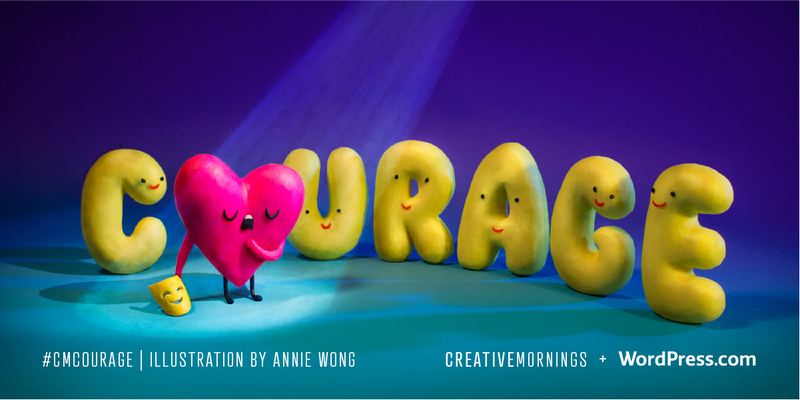 Come find out and learn more about courage from designer Margaret Cyphers—Creative Director for Google G Suite and Head of UX for Google Drive—this coming Friday, March 9th, at 8:30am at the Denver Art Mus​eu​m. Can curiosity change the world? Can it help us to be more creative? How does curiosity propel us? Why is curiosity so fundamental to the human experience? February’s global CreativeMornings theme implicitly and explicitly asks these questions and eludes to some of our best collective answers and anecdotes surrounding the value and power of curiosity. As humans, we have had a strong desire to learn and gather knowledge since it all began! It seems to be in our blood to synthesize our experiences, and skills and passions, and knowledge, and even our inherent human needs, and then ask deep meaningful questions that expand our potential, our understanding, and help us to address important challenges and objectives. We do this individually and collective in all sorts of ways. This affects culture, business, politics, and our very experience as humans. Our ability to ask, both reactively and proactively, big questions has equipped us to test perceived limits, perceived systems and rules, to expand or deepen our lives and our contributions, to enlighten us spiritually, economically, and politically, to build incredible infrastructure and societies, and to connect and bond with other humans and the world around us. We’re just wondering, how does curiosity show up in your world? In your work? In your life? Join CreativeMornings/Denver on February 6th at RedLine Contemporary Art Center and hear from Derek Friday about how curiosity relates to his personal life and his profession as an Environmental Designer.